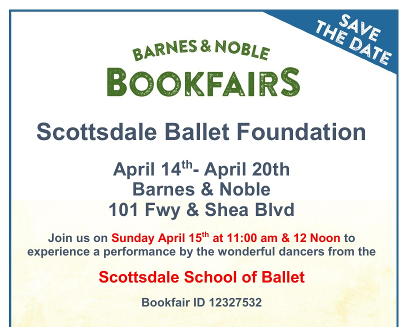 When: Sunday April 15th 11:00 a.m. & 12:00 p.m.
Stop by the Barnes & Noble at 92nd Street and Shea Blvd to see the dancers from Scottsdale School of Ballet on April 15th at 11:00 a.m. and 12:00 noon perform excerpts from the upcoming SBF sponsored “2018 Soiree de Ballet” at the Herberger Theater Stagewest on May 19th and 20th. This is a nationwide event so please pass the flyer on to everyone you know, FLYER HERE in PDF . They can make purchases at any Barnes and Noble in stores from April 14th – April 20th. Visit BN.COM/bookfairs to support us online from 04/14/18 to 04/25/18 by entering Bookfair ID #12327532 at checkout. 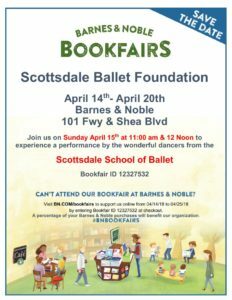 Come and see our dancers on April 15th and even if you cant make it or are not shopping, you can make a donation to the Foundation. Just click on the link above and go to the Donate link. All donations are greatly appreciated and thank you for supporting ballet in the community.